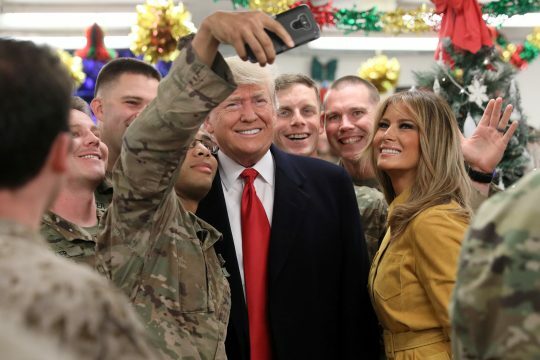 AL ASAD AIR BASE, Iraq (Reuters) – President Donald Trump made a surprise Christmas visit to U.S. troops in Iraq on Wednesday, his first trip to a conflict zone nearly two years into his presidency and days after announcing a pullout of American troops from Syria. Air Force One touched down at the Al Asad Air Base west of Baghdad after an overnight flight from Washington with first lady Melania Trump, a small group of aides and Secret Service agents, and a pool of reporters. He was expected to stay for around three hours. Trump has drawn fire from some in the U.S. military for not having visited U.S. troops in conflict zones since taking office in January 2017, particularly after he canceled a trip to a World War One cemetery in France last month due to rain. While there has been no full-scale violence in Iraq since Islamic State suffered a series of defeats last year, U.S. troops train and advise Iraqi forces still waging a campaign against the militant group. On his way home from Iraq, he will also stop to visit troops at Ramstein Air Base in Germany. Trump was looking for some positive headlines after days of turmoil over his decisions to withdraw all U.S. troops from Syria, pull out half of the 14,000-strong contingent in Afghanistan, and push out Defense Secretary James Mattis two months earlier than planned for criticizing his policies. On his stop in Iraq, he defended his decision to pull out the 2,000 troops from Syria, which he has said was made possible by the defeat of Islamic State militants. His critics have said that fight is far from over and the withdrawal leaves allies in the lurch. One of those critics was Mattis, who said in a candid resignation letter last week that his views did not align with the president’s, particularly in regard to the treatment of U.S. allies. Mattis had planned to leave at the end of February but Trump forced him to go on Jan. 1 after his resignation letter. Trump has also faced negative headlines for wanting to pull troops from Afghanistan where they have been since 2001. Trump has questioned how long troops there should have to remain in what has become America’s longest war. Trump’s unannounced visit to Iraq followed in the footsteps of two of his predecessors, Republican George W. Bush and Democrat Barack Obama, who both made surprise trips to see troops. The U.S. military says it has about 5,200 troops in Iraq, focused on training and advising Iraqi troops to ensure that Islamic State does not re-emerge. NATO defense ministers agreed in February to a bigger "train-and-advise" mission in Iraq after a U.S. call for the alliance to help stabilize the country after three years of war against Islamic State. Trump has also wanted to end protracted U.S. involvement in overseas conflicts, and to force allies to pay more for the costs that he says fall disproportionately on American taxpayers. This entry was posted in National Security and tagged Iraq, President Trump. Bookmark the permalink.